13% of IT executives claim success at developing skills to meet changing IT infrastructure needs. While the topic of IT infrastructure continues to permeate conversations across industries, the content, participants and tones of those conversations are changing. As business leaders across the C-suite recognize the link between a strong IT infrastructure and the ability to drive competitive advantage, they also understand that this dependency will grow with continued advances in big data and analytics, cloud, social and mobile technologies. 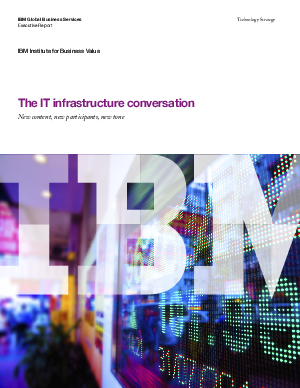 To understand how this IT infrastructure conversation is changing, the IBM Institute for Business Value, in conjunction with Oxford Economics, surveyed 750 IT executives. We sought to determine how prepared their IT infrastructure is to meet the needs of today’s changing business environment, as well as where they are looking to invest their resources. Further, our survey investigated the relationship between core business and IT parts of the organization in managing infrastructure issues.